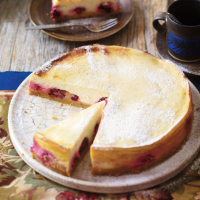 The original cheesecake is said to date back to ancient Greece. This dish is perfect for preparing ahead and uses seasonal British blackberries. 1. Preheat the oven to 190ºC, gas mark 5. Mix together the crushed biscuits and butter until well combined then tip into the base of a deep, 23cm loose-bottomed cake tin. Press down firmly with the back of a spoon and place in the fridge to chill. 2. Meanwhile, place the soft cheese, soured cream, caster sugar and vanilla powder in a large bowl and whisk together until smooth. Add the beaten eggs and whisk again until well blended. 3. Arrange the blackberries on the biscuit base and dot with the lemon curd. Spoon over the cheesecake mixture. Sit the tin on a baking sheet and bake for 40–45 minutes until set and golden brown. Leave to cool in the tin then chill for at least 2 hours or overnight before dusting with icing sugar and serving. Try using other biscuits for the base, such as ginger nuts or digestives.